The new AKAI MPC 2.4 update includes 16 classic Pro Tools effects, 12 all-new plug-ins, a new “Mother Ducker” side-chaining effect, noted improvements and newly added support for FLAC and OGG files formats… plus much more! This major software and firmware update introduces a number of user-requested features and functionality enhancements, notably the addition of 28 effects from critically-acclaimed DSP gurus AIR Music Technology and a much-requested side-chain compressor, the Mother Ducker. 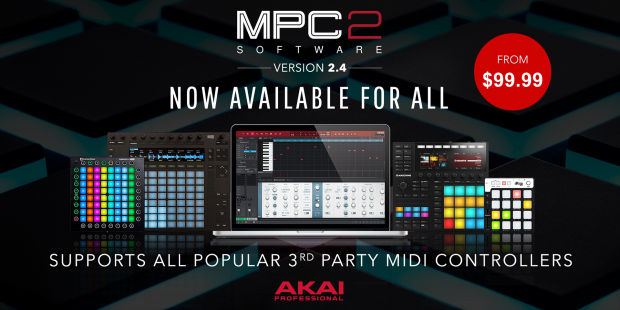 MPC 2.4 is free for existing MPC Software 2 owners (2.0 – 2.3), and is available for download in their registered account area at the AKAI website. This entry was posted in DontCrack, Plug-ins, Promotions, Sounds, Virtual Instruments and tagged AIR Channel Strip, AIR Creative FX collection, AIR Music Technology Effects, AIR Transient, AKAI, AKAI Professional, Mother Ducker, MPC 2.4, MPC Live, MPC X. Bookmark the permalink.